The much-awaited 2+2 talks between India and the United States are underway. 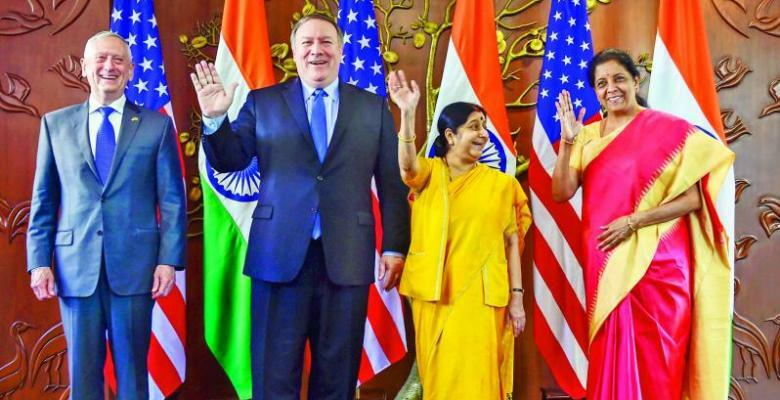 U.S. Defense Secretary Jim Mattis and Secretary of State Mike Pompeo have begun meetings with India’s Foreign Minister Sushma Swaraj and Defense Minister Nirmala Sitharaman to address some key issues of interest to both nations. The 2+2 accords have already been canceled twice this year due to diplomatic urgencies – Secretary Pompeo needed to make a quick trip to North Korea the last time the talks were scheduled. Finally, it seems the talks will take place. And not a moment too soon. 2+2 is the highest level of dialogue between the two countries and was agreed upon by President Donald Trump and Indian Prime Minister Narendra Modi already last year. This is just the latest move by India to incorporate more drone tech into its military. The military will reportedly come up with a formal plan by next April and decide whether these platforms will be manufactured at home or purchased from a foreign country, most likely Israel. Another piece of news emanating from India regarding drones was the release of India’s first drone legislation. In addition to requiring licenses and setting an age limit for operating these machines, the law also sets down a series of no-fly zones for drones. Included in these locations are areas 25 kilometers from any international border, 500 meters from a coastal area, three kilometers from any military installation, and five kilometers from any airport. This legal development may seem less interesting to the foreign observer, but really, the military’s drive for drone procurement and the recently codified domestic drone policy are two sides of the same coin. India has become aware of its need for drones to surveil its enemies and patrol its borders. At the same time, India doesn’t want to become the victim of these same tools by foreign operatives – or even kids having a fun time who decide to post their aerial photo of a military base to their Instagram account for the whole world to see. So what is driving India’s obsession with drones as of late? Well, China of course. Recently, New Delhi’s concerns over China have grown to more than just the residue of a decades-old conflict. First, there is a general sense of Chinese expansionism felt by many Asian countries. Add to this recent Indian government projects to expand roads and highways in Arunachal – infrastructure many are concerned could be utilized by invading Chinese forces – and you have China very high on the list of national security concerns. India for its part is on heightened alert for Chinese aggression these days. The nuclear-armed Asian giants were locked in a 10-week military stand-off last year in Doklam, a remote, high-altitude stretch of border area in the Himalayas. This will undoubtedly be a primary focus, if not the main issue of the talks as they continue. Despite a lot of media hype about India’s defiant move of purchasing weapons systems from Russia and how that will play into the current meetings, India and the U.S. share important common interests in almost every sphere, from economics to defense. Countering China is the most pertinent mutual concern bringing the two countries together.